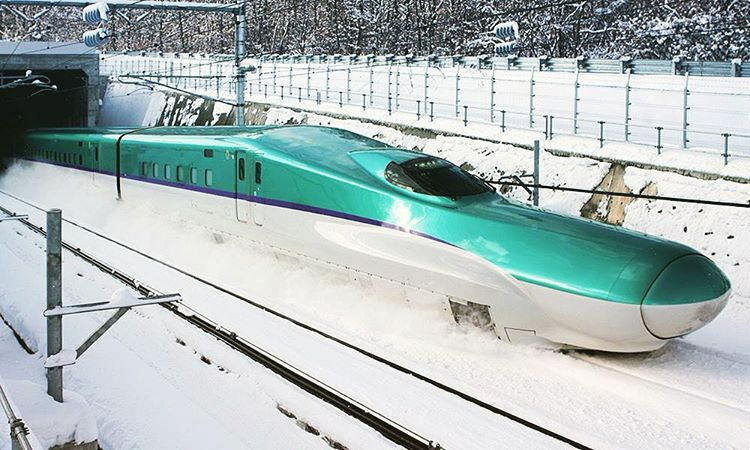 The Hokkaido Shinkansen Hayabusa runs on the Seikan Tunnel, one of the world's longest underwater tunnel, which connects Aomori Prefecture with Hokkaido. The Shinkansen bullet train, a marvellous feat of engineering and design, is probably one of the most significant symbol of Japan. Hokkaido’s first Shinkansen is named the Hayabusa (Japanese for Peregrine falcon), like Suzuki's famous record-breaking motorcycle. Japan's northern island is now easily and comfortably accessible from Tokyo on a 674km journey that gets cleared in about 4 hours' time. The top speed of the Hayabusa Shinkansen reaches the impressive number 260 km/h. The one-way fare between Tokyo and Hakodate is about JPY23,000 for a regular reserved seat. But don't fret - since Japan has a comprehensive JR Rail Pass system to enable all tourists to utilize the efficient Shinkansen and other train services on a budget. 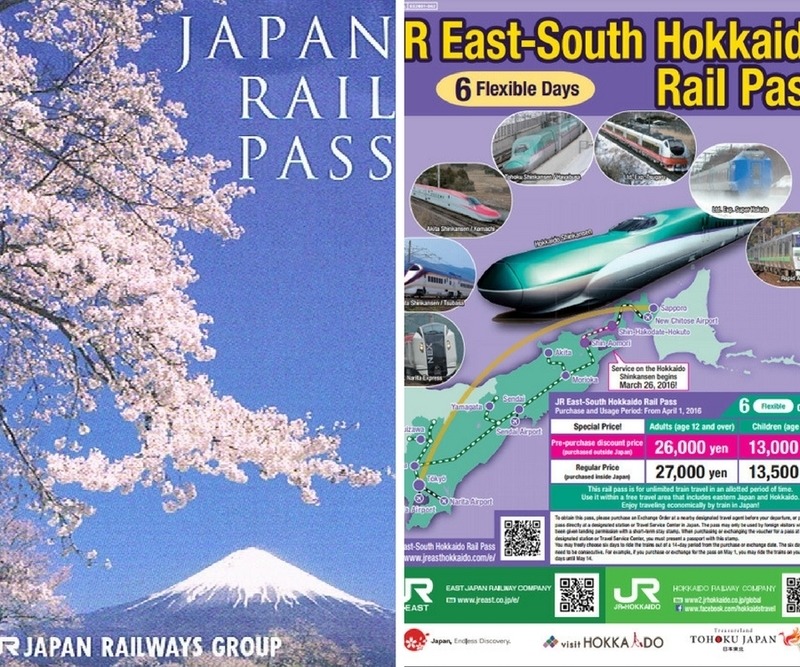 WIth the National JR Pass or the regional JR East-South Hokkaido Rail Pass, one can enjoy the the Hayabusa Shinkansen connecting Honshu and Hokkaido. 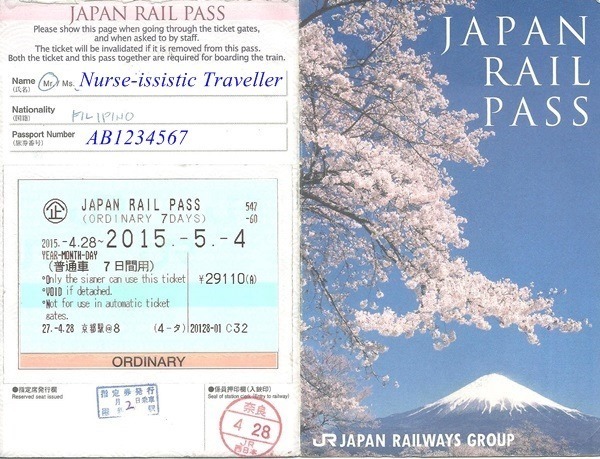 Example of a JR Pass in Japan - The majority of the JR passes mostly look the same but may feature a different cover. The name and passport number of the traveler is written on the pass and is non-transferrable. A new addition for this year, an online seat reservation for Aomori - Hakodate system is now available! It is now more convenient than ever for passholders to plan for their trips! In addition, JR Sapporo Station, New Chitose Airport Station, Shin-Hakodate Twinkle Plaza, Noboribetsu Station are some of the newly added stations for ticket pickup as well! Depending on your travel plans, you can choose to purchase a JR pass to complete the Honshu - Hokkaido journey. The National JR pass encompasses the whole Japan and passholders can also use all JR Group Railways – Shinkansen (except NOZOMI and MIZUHO trains), express trains, local trains, etc! Passholders are also entitled to board the Tokyo Monorail, local lines of JR Bus as well as JR West Miyajima ferry. However, the pass is of a consecutive days basis and you are allowed 7 straight days of usage rights once it's activated. The JR East-South Hokkaido pass suffices if you only plan on visiting Tohoku and the southern part of Hokkaido. It offers great flexibility for pass holders as one can choose any 6 days out of a 14-day time frame. This will be a great option for travelers who would like to disembark on a journey to discover the numerous ski resorts in the northern and eastern part of Japan. 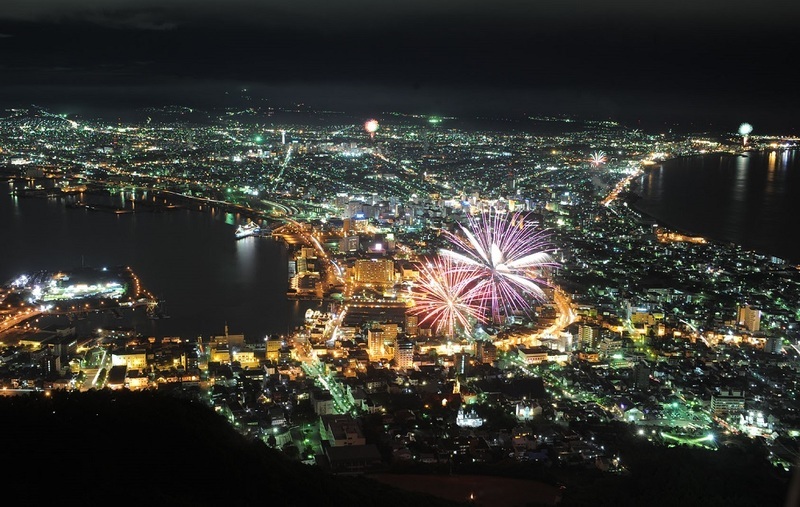 It is definitely worth it to visit the ''Million Dollar'' night view at Mount Hakodate. Mount Hakodate is of a total height of 334 meters. It is easily accessible via Hakodateyama Ropeway which departs from Motomachi district or direct buses. Wake up early and visit the popular morning market where you can find lots of fresh seafood at great price! Catch an evening train to Hakodate to Kutchan (approximately 3 hours). This is a local train service and requires an interchange at Oshamambe. You can catch a taxi, a scheduled bus or a hotel transfer to get to Hirafu afterwards. Wake up early to enjoy the delicious kaisen-don (seafood bowl) for breakfast at the popular Hakodate Morning Market. 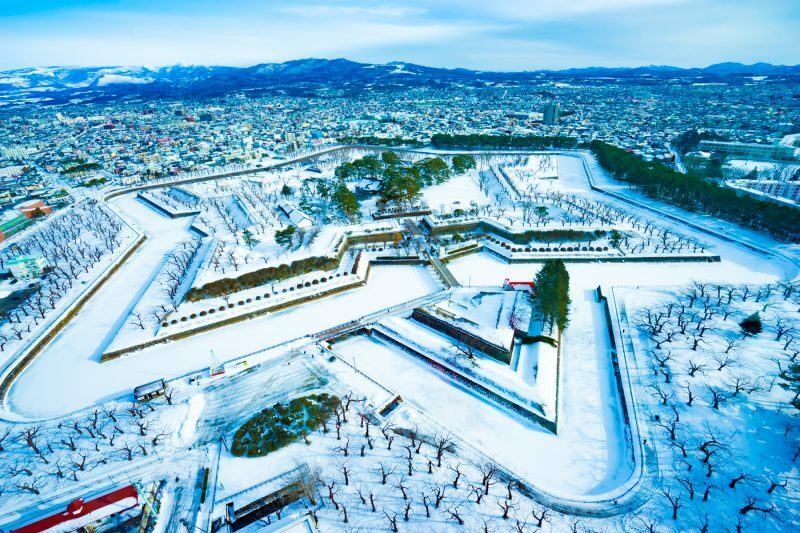 Fort Goryokaku is a gargantuan star-shaped fortress built in 1864 to defense against the western powers. Unfortunately the fort turned into a battleground in the Battle of Hakodate during 1868 - 1869. It was rebuilt as a park using the remaining star-shaped setting and it is now a popular sightseeing attraction in Hakodate. Catching the evening train from Hakodate will bring you to Niseko around 9 to 10 pm at night. Once you are in Hirafu, we recommend spending at least 5 days to enjoy our venerable champagne powder snow. In addition, we have also a wide range of activities such as ice fishing, snowmobiling and many more for families to enjoy this fairy-tale silvery world. Refer to our previous blog entry to find out the off-ski activities available in this region. Niseko is the winter paradise for everyone - whether you like skiing or just want to experience a white winter with various off-ski activities. On your departure, you could again go to Kutchan to catch the JR train to Sapporo and spend a night or two to enjoy the capital of Hokkaido. Great sightseeing spots are not to be missed and hundreds of shopping venues will let you head back home with luggage full! From Sapporo, you can easily complete your getaway in Japan's north by heading back to the New Chitose International Airport and fly back home from there! We look foward to seeing you in Niseko this winter. Are you interested in visting the wonders that await in Japan's best northern destinations? Don't hesitate to contact Vacation Niseko now if you need any assistance with your holiday planning! Our staff will be delighted to craft a tailor-made vacation package that will ensure you don't miss out on any must-do!